VATICAN CITY (CNS) — Despite some new tensions, “practically the whole of Christianity is in a process of advancing beyond the controversies and competition of the past, toward greater understanding, trust and solidarity,” said Bishop Brian Farrell, secretary of the Pontifical Council for Promoting Christian Unity. The bishops’ article was published Jan. 24 during the Week of Prayer for Christian Unity. To illustrate how “not all is plain sailing” in the search for Christian unity, Bishop Farrell pointed to the challenges posed by a dispute within Orthodoxy over the question of authority and by a controversy within the Catholic Church over allowing the husband and wife in a Catholic-Protestant marriage to receive Communion. The tensions within the Orthodox Church, particularly between the Ecumenical Patriarchate of Constantinople and the Russian Orthodox Church over the ecumenical patriarch’s recognition of the independent Orthodox Church of Ukraine, have implications for the Catholic-Orthodox dialogue as well, the bishop said. “Whether and how the dialogue commission can effectively and usefully continue its work in the present situation is now an impelling question,” he wrote. On the Catholic side, he said, “a crucial test of ecumenical resolve” resulted from the debate over a plan by the Germany’s Catholic bishops to make it easier for the Protestant spouses of Catholics to receive Communion with their husband or wife. In the end, Pope Francis asked the German bishops to shelve the plan until they could reach a fuller consensus on it. Current church law permits sacramental sharing in cases of “grave need” when it is clear the person receiving the Eucharist shares a “Catholic faith” that it is Christ’s body. 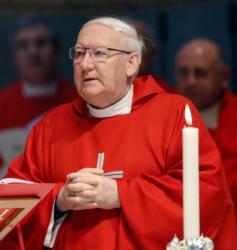 But the work and prayer for Christian unity made strides in 2018 as well, he said, citing Pope Francis’ visit to the World Council of Churches, the dialogues the Catholic Church is involved in, the dialogues other Christian churches are pursuing and, especially, the “dialogue of life and love” conducted by many Christians of many denominations. The bishop said a “turning point in the ecumenical quest” could be reached when — as Pope Francis said Jan. 18 — Christians realize it is “a grave sin to belittle or despise the gifts that the Lord has given” to other Christians and instead acknowledge their value.